Founded in 2002, Sloemotion is a small family business based at Green Farm, in the village of Barton-le-Willows, just north of York and nearby to the market town of Malton in North Yorkshire. This event to celebrate world gin day on June 8th will be hosted by Sloemotions brand Ambassador Adam who will guide you through each edition giving tasting notes, perfect serves and gin facts. 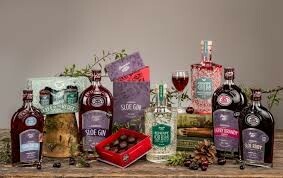 A history of gin and the story of Sloemotion will also be part of the discussions. Included in the ticket price will be 3 full size Gin and Fevertree tonics, and a Damson gin cocktail all served with garnishes, and a mouthwatering selection of canapes including, mini yorkshire puddings with roast beef and horseradish, brie and grape crostinis, honey and mustard cocktail sausages, red pepper mini quiches, BBQ belly pork bites and Pate and caramelised onion squares, all freshly prepared on the evening. Early booking is advisable as tickets are limited.